Thanks! 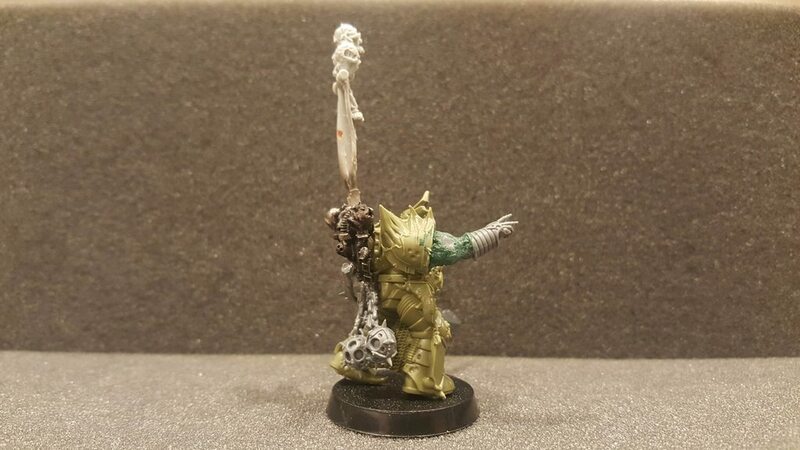 I'm considering swapping out the right pistol hand for Ahriman's casting hand instead, though... he's a sorcerer after all, I fear holding the Force Weapon and Pistol make him look a little too generic. 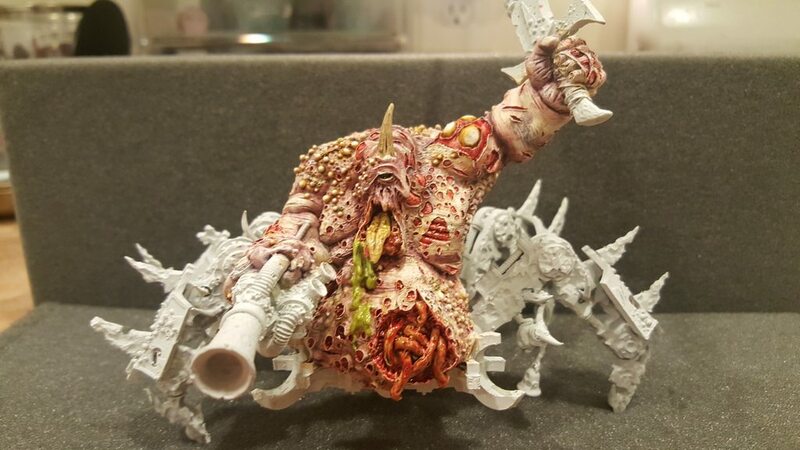 wow, lovely painting and cool conversion work too! 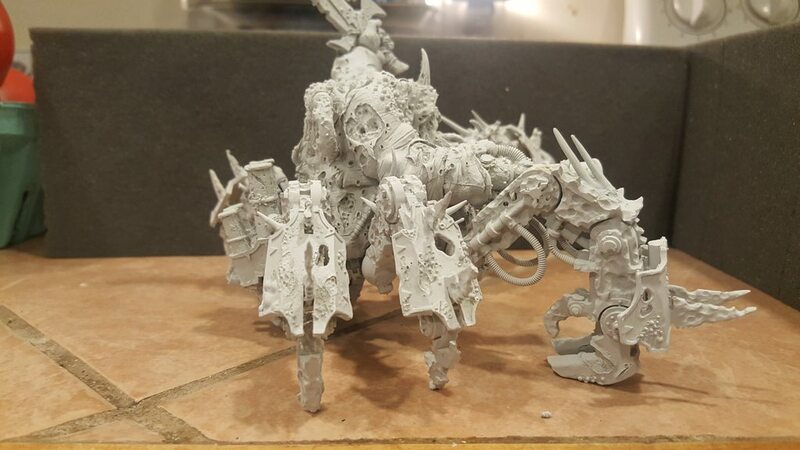 That's some really clever kitbashing on the Necrosius conversion! Excellent work! Thanks guys! 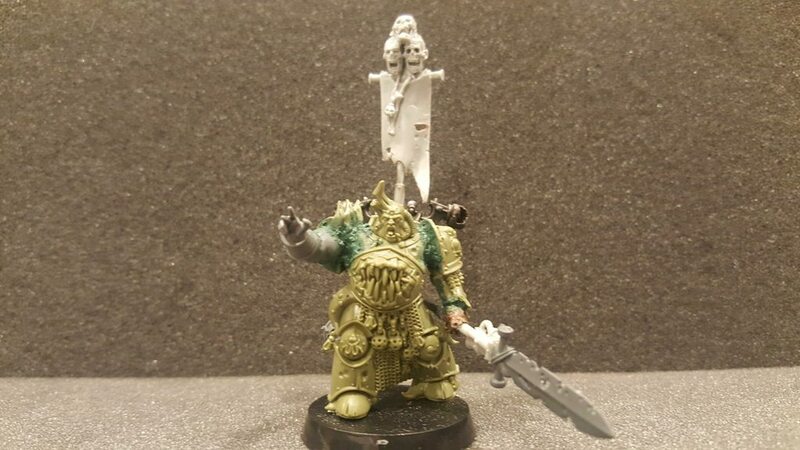 Actually it was you, my German Scientist friend, that gave me the inspiration to make a Necrosius model with your converted Sorcerer, so thank you. 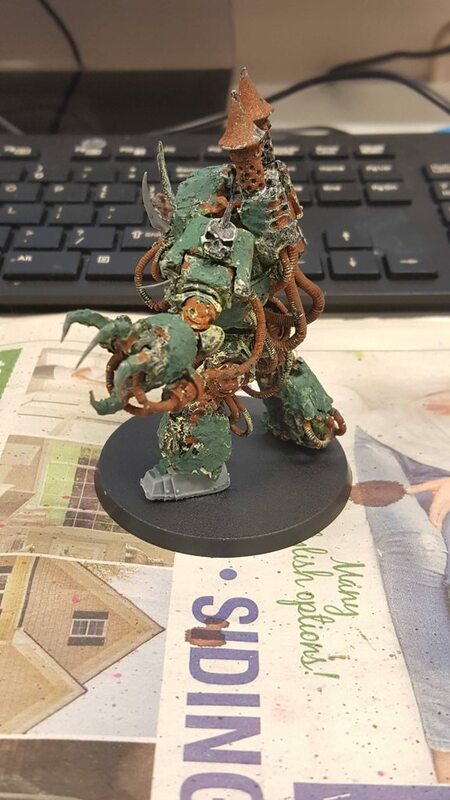 I've also dug up an old model of mine from about 5 years ago... a Contemptor Dreadnought that I had Chaosified (is that a word?) to make it 40K Death Guard. What seemed great at the time, very pock marked and corrupted, now looks like too much of a good thing IMO. I went wild with the dremel and it shows. To make matters worse, I had stumbled upon this rust effect paint at the time. It was an actual metal paint that once you applied a liquid solution to, created real rust. I thought it was the bee's knees. Gods, how wrong was I... well it seems even Simple Green says "nah" to completely removing it, so I'll be priming over it and starting again. But first, I've been trying to smooth over the many pocks on the model with liquid green stuff. I want corrupted and beat up, but not this much. I'll try to get some pics on here by the end of the night to show you what I'm working with. As promised, I've taken some pics of the Contemptor I'm currently working on. It's getting there as far as filling the over zealous corruption from years past and will soon be given a new lease on life. It's kind of bittersweet to have it back in action, considering I remember the day I finished it was the same day my father died. When coming home that night, I found our puppy had jumped about 3 feet to grab it off of the shelf it was sitting on and chewed it up (hence the new Contemptor foot on the left leg). At the time I was mad, but then I just never really wanted to touch the model again. And yet, here we are... so I guess you could say I have something of an attachment to it. So let me know what you think of this guy and Necrosius above. Any suggestions, etc. are welcome and appreciated. 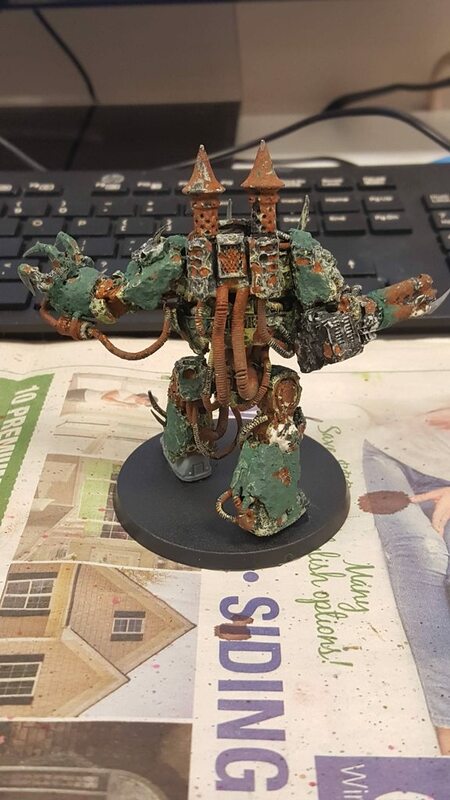 DR, I just moved to a new paint stripper that works great on plastic and resin and you might give it a try on that Contemptor. I just saw that, I may have to give it a try. I'm not even sure if it's considered paint or rusted metal at this point. Just for future reference for everyone: don't use rust effects paint unless you're 100% sure that's what you want to do, otherwise you'll end up in a situation like mine. 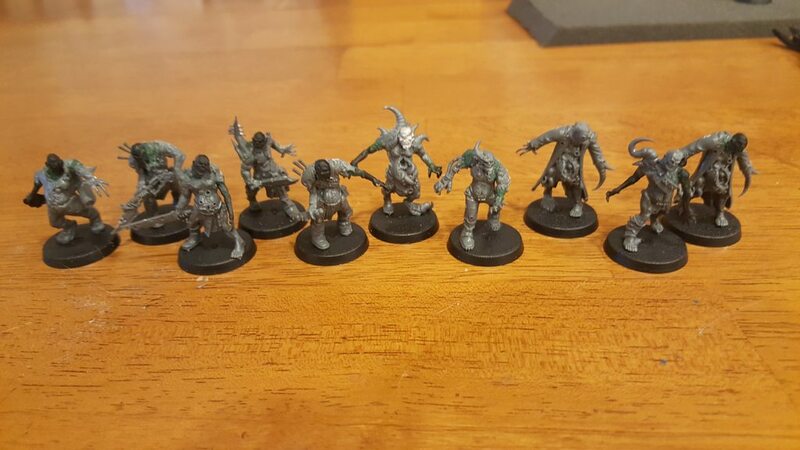 After weeks of sitting on them, I finally finished converting the next 20 Poxwalkers. I'm pretty pleased with the result, as I wanted them to be less... gribbly, I guess. Of course when on the battlefield, they'll be mixed in with the regular models as well to keep things more varied. On the painting front, I have no pics to share but the second unit of Plague Marines is coming along well, as are the Blightbringers. I've also begun painting my Necrosius conversion along with his other two buddies from the Easy to Build box and the Contemptor. Hopefully I'll have it all finished by this time next week. Until then! Awesome work! I'm really impressed by the crisp armour and the horns. How did you get the horn looking so good? Two+ Layers of Windsor & Newton Black India Ink. You'll want to do this toward the tip of the horn, but you can vary it to give some variation (the same with any of the other previous steps). It may take a few layers to get it jet black at the tip. That's about it! It's time consuming but not particularly difficult and the effect is nice. Oddly, the pics seem to show a defined line where the inks begin, yet to the naked eye they're blended. 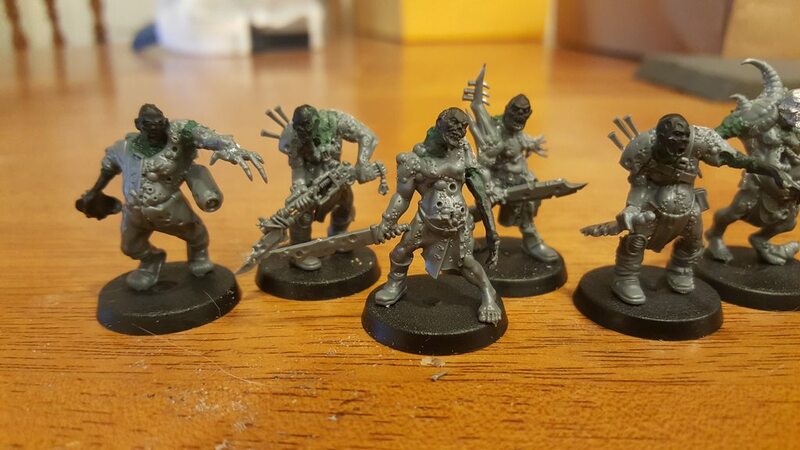 Really liking how unique the pox walkers look. 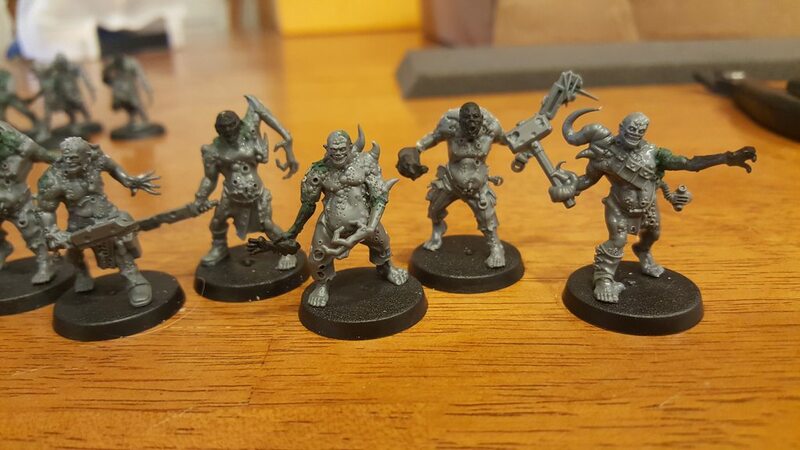 Your conversions thus far have been great! 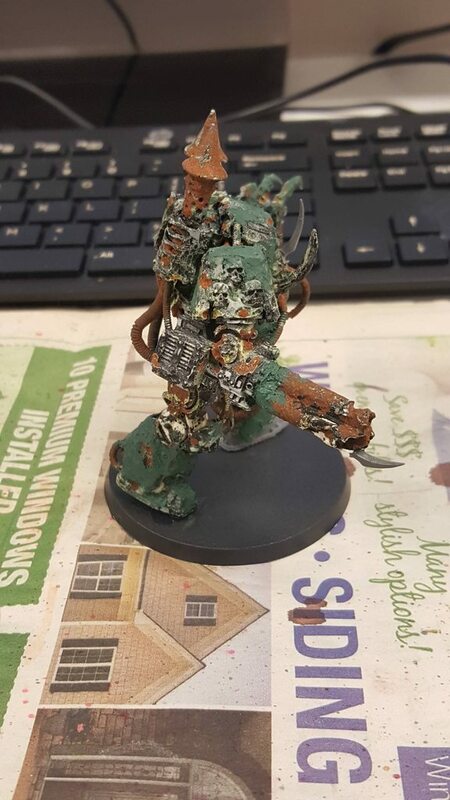 Did you manage to strip the paint on the contemptor? 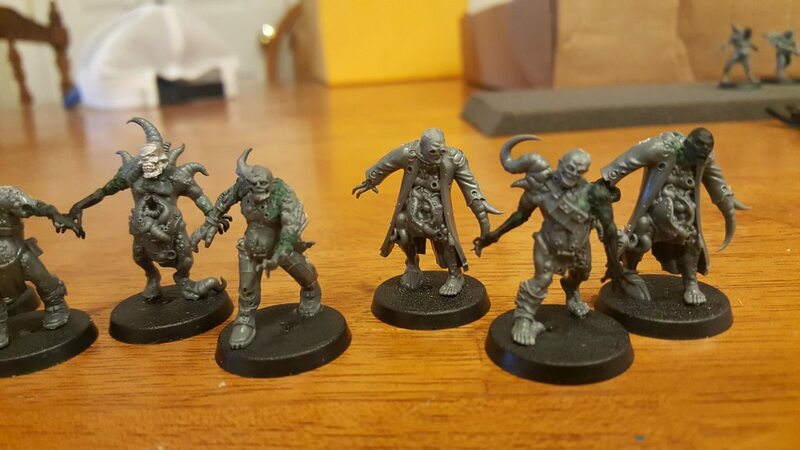 Thanks, I'm trying my best to avoid redundancy with the Poxwalkers. Yup, I stripped the paint off as well as I could... The rust just wasn't budging, so I just primed over it. No big deal. The issue I'm facing with the Dreadnought now is how to paint what would be metal. 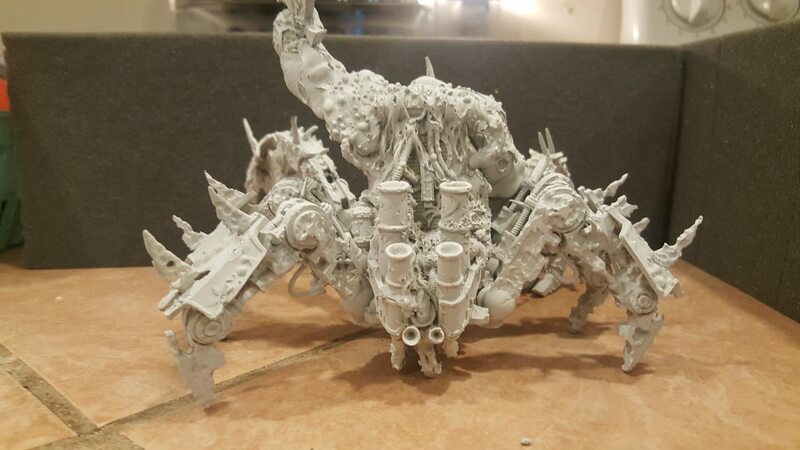 I have a feeling it will end up looking more like Bloat Drone with a complete absence of silver on it, which... is a little disappointing but what can you do? The White and black are done on it and there's no iconography to paint red, so this model will probably end up a lot easier to paint than I had planned. 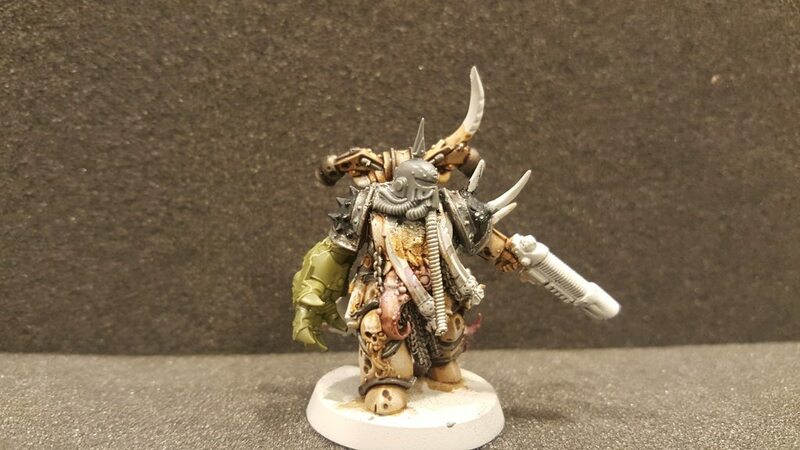 In the future if I decide to make more Contemptors I'll just use the FW Death Guard model and go from there. The two units seem to fulfill the same role in the army, with the Plague Hulk being MUCH more difficult for the enemy to take down. He didn't do much damage unfortunately (I blame bad dice rolls), but in the future I'll probably leave the Contemptor at home and take the big guy instead. Due to his size he's a bullet magnet as well. The model itself has been 5 years (at least) in the making. 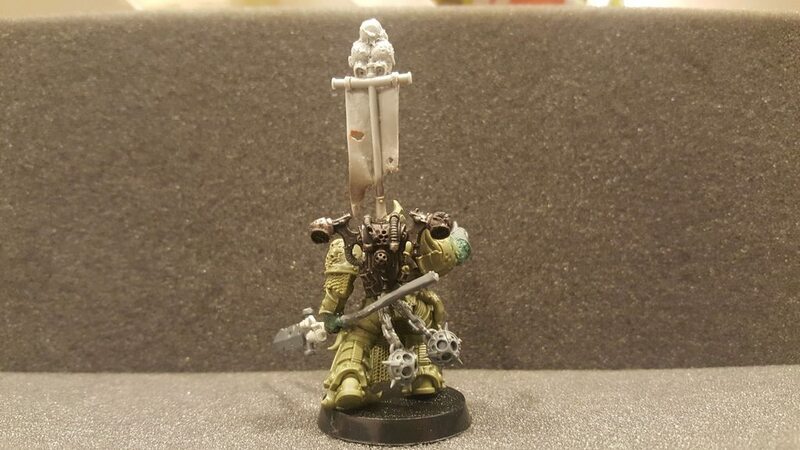 I picked this guy up off of eBay to make a total of 3 and fill the Heavy slots of my old Death Guard unit. Unfortunately, I sold the other 2 last summer along with all 9 of my Blight Drones... something I'm really kicking myself for now, but I didn't expect to ever play 40K again since I was so engrossed in 30K. 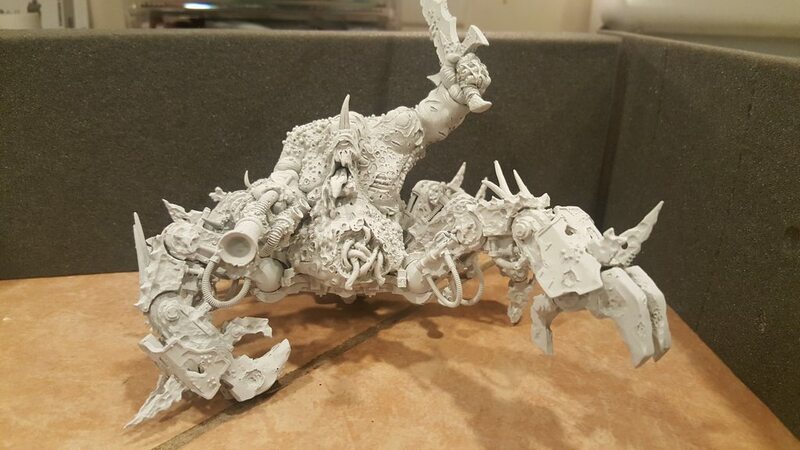 This guy was spared the auction block due to being partially assembled and I was in the process of modifying the Defiler chassis to match the FW parts. That always bothered me with this model... such an awesome detailed model, slapped on a plain, boring Defiler kit. 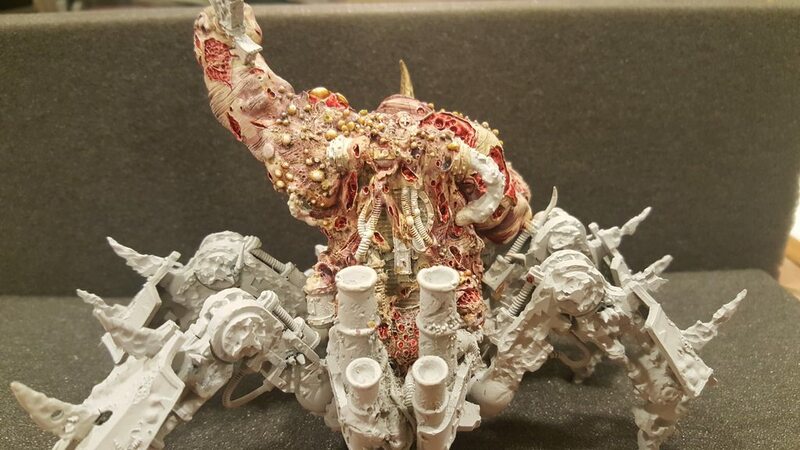 It always looked off to me having the rotted metal of the body and arm shields / claws on the Defiler chassis. So I had decided I'd try and make it blend in a little. I took the dremel to it to give the armour pocks and damage and added horns and on one arm, a maggot infestation. I also replaced all of the plastic tubes with metal ones form Zinge Industry. I'll start throwing paint at this guy very soon, as I've been waiting close to a decade to see him done. 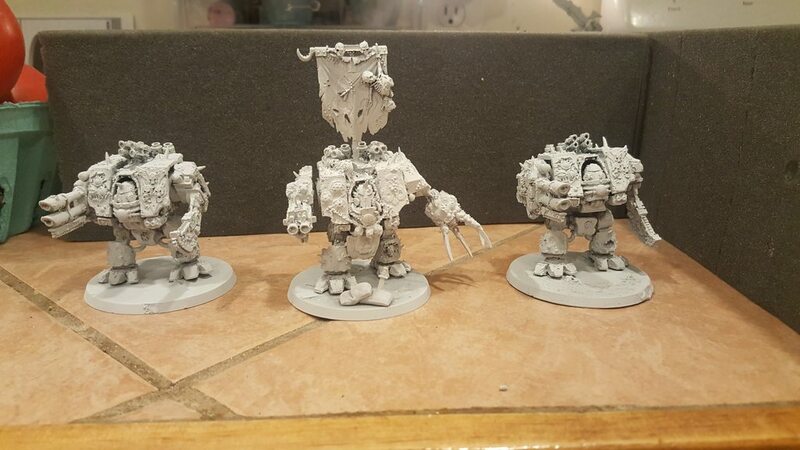 Nothing crazy, just my 3 FW Death Guard Dreadnoughts. I probably could have used those LasCannons yesterday to take some of the burden off of my other units. 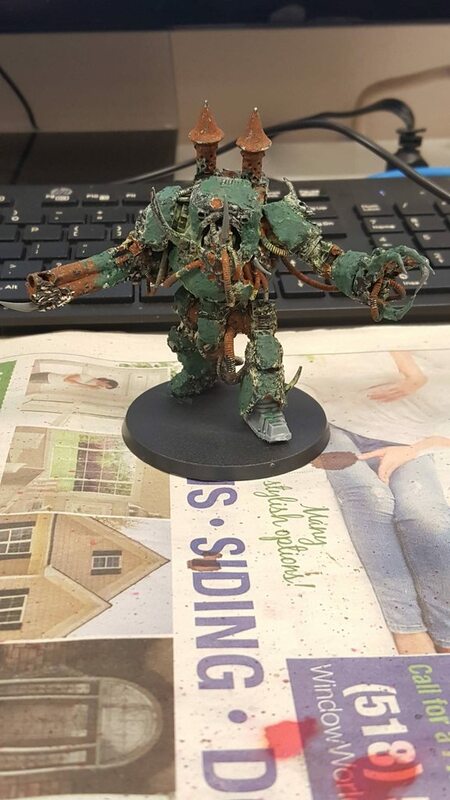 Your plague hulk looks so good I mistook it for official FW until you told me otherwise. 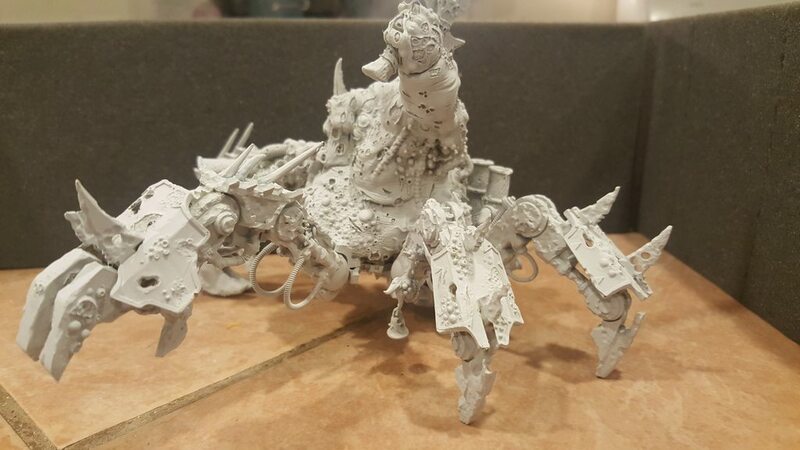 Well technically it is official FW, I just modified the Defiler chassis to match the FW bits as best as I could. 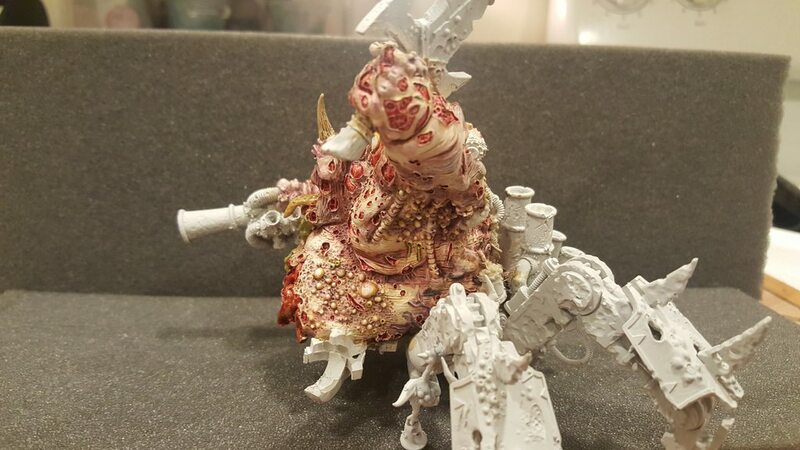 I know, but I assumed that's how it was from FW, Defiler chassis and all. It's a compliment, just take it! The flesh is complete. At this point, I've got to finish the horn and fingernails, then it's on to the mechanical parts. I'm undecided on what color to do the chassis. I'm siding with mainly white and the limb... guards?... in black, to match the rest of the army. I was also contemplating just black or even all rust. I need some opinions or advice on what to go with before I proceed, so please... give me your input. 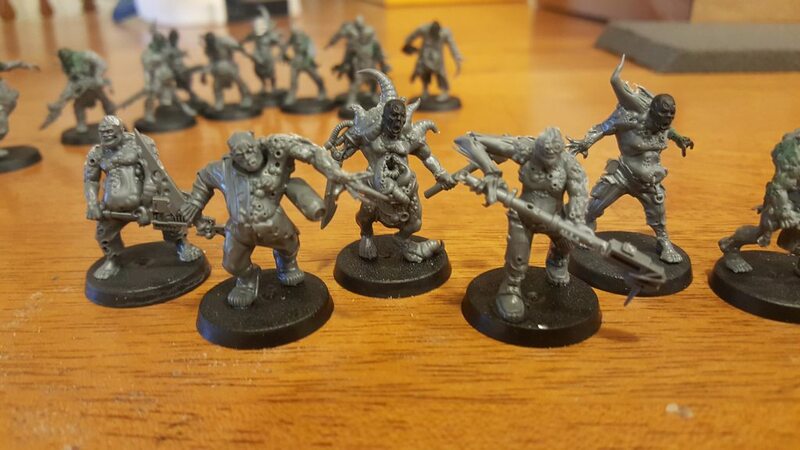 Hopefully they will bring more pox walkers out. Unlike what the did with the cultists. I recon spraying over the rust effect on the contemptor will give it a cool texture to paint. 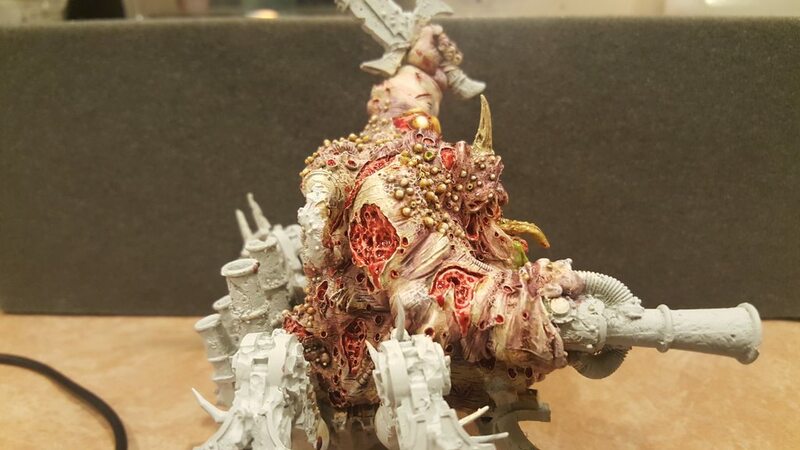 That conversion on the champ looks better that the first one, the vent pipes coming out of the helmet really are nurgle looking. Also, the open wounds on it are properly disturbing. I don't think a model has ever made me wince before. It's amazing.....I think. Edited by Corswain, 09 August 2017 - 07:28 AM. Thank you! 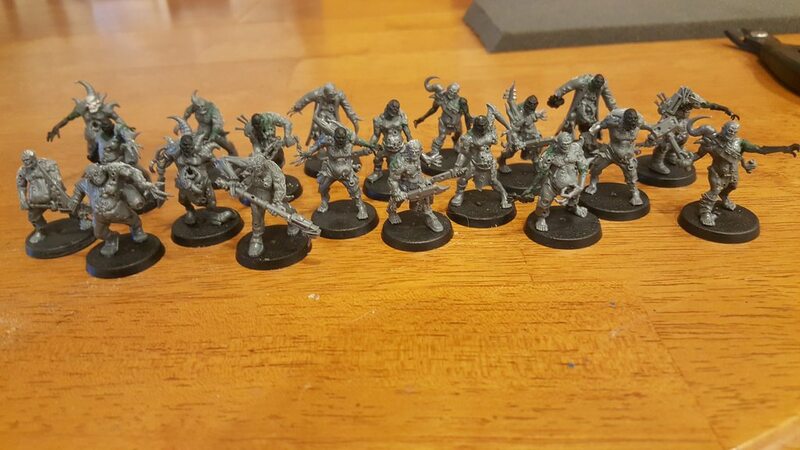 I doubt they'll release more for Poxwalkers than they already have (Start Box & Easy to Build kit), but you never know... they may surprise us. 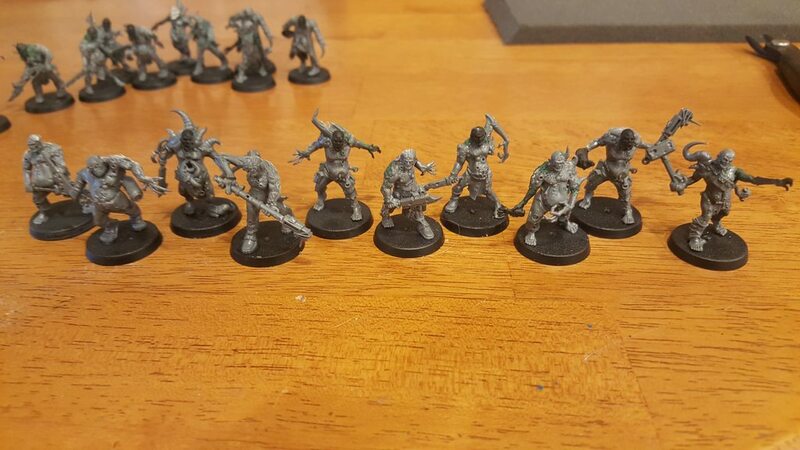 In the meantime, there's a ton of different companies that we can mix and match parts with the Walkers to make more unique models. I'm quite pleased with the Champion myself, I think he's my favorite conversion I've done for the army so far. Also, I believe you're right with the white. I've applied the first layer of Seraphim Sepia, we'll see how it turns out but I have high hopes.